AVN-PA8, Showing the Standard Front, the 'D' Front, the Standard Rear and the 'T' Rear Panels. The AVN-Portal series is a group of three powerful audio mix engine interfaces (AVN-PA8, AVN-PD8 & AVN-PM8) capable of audio routing, metering and equalisation. They have both physical audio I/O and AES67 stream I/O and can mix and route freely from any input to any output, useful for a multitude of applications. See the portal landing page (link here) for summary information for all of the portals. Communication between products is via RAVENNA/AES67 AoIP allowing simple CAT 5 cabling and expansion. They advertise streams using Avahi/Bonjour and SAP so can be used for Dante™ AES67 enabled streams too. 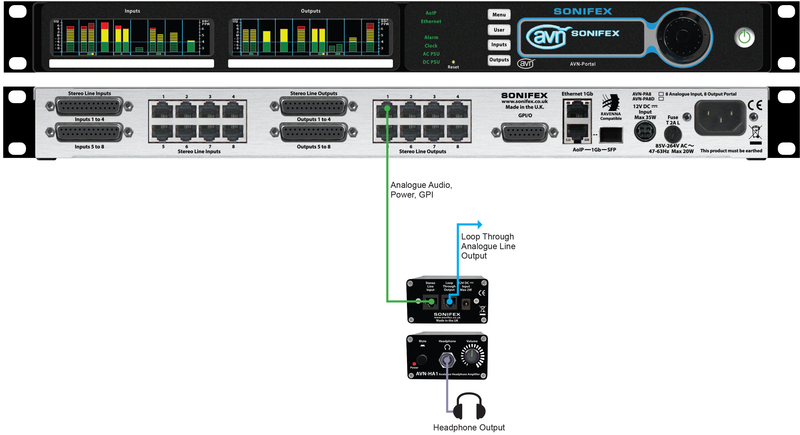 8 output analogue zone mixer, with individual output gain control. 8 channel clean-feed generator, with input mixing and gain control on inputs and outputs. Distribute 8 stereo channels of audio over an SFP fibre connection. 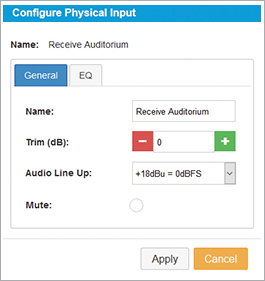 IFB generator to send 64 x AES67 streams to individual belt-packs. 8 output headphone distribution system, with separate input mix for each headphone output and individual gain control. Input mixer with input/output metering and AES67 stream generation. 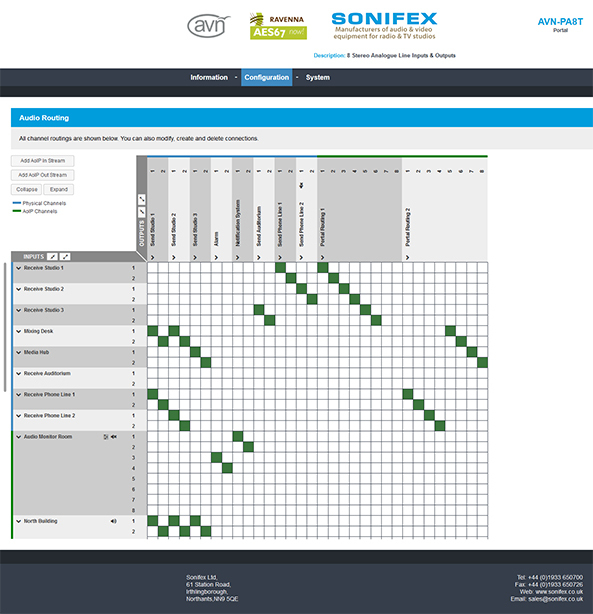 A built-in responsive web server provides complete remote configuration & control of the unit including matrix mixing and routing, and also allows for firmware updates and configuration backup. Complete product configurations can be saved and loaded for use in different situations and system logs can be saved for device information. The key to the success of the AVN-PA8 is the mix matrix where physical inputs can be freely mixed and routed with AES67 streams, in a simple and intuitive way to both physical outputs and AES67 streams. 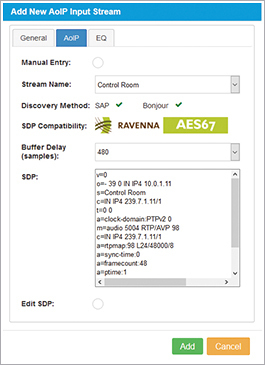 The unit can stream RAVENNA & AES67 AoIP streams or AES67-enabled Dante® flows (discovered using SAP). 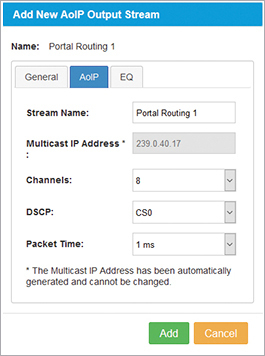 It can receive AoIP streams from 16 additional AES67 sources and can send to 64 additional AoIP destinations. 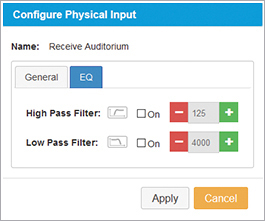 Input and output AES67 streams can be individually added/modified and the SDP of each stream can be checked and edited. DSP functions, such as gain and filtering, can be added at inputs, outputs and cross-points. The unit can act as a PTP masterclock or slave clock and supports IEEE1588-2008 PTPv2 media and default profiles. The AVN-PA8 can be supplied with different front and rear panels. As standard it has a front panel display to show product information and it uses XLRs and D-types for rear panel connectivity. Using an OLED display, the front panel provides detailed status information on device name, network addresses, PTP clocking info, power status/voltages and version information. 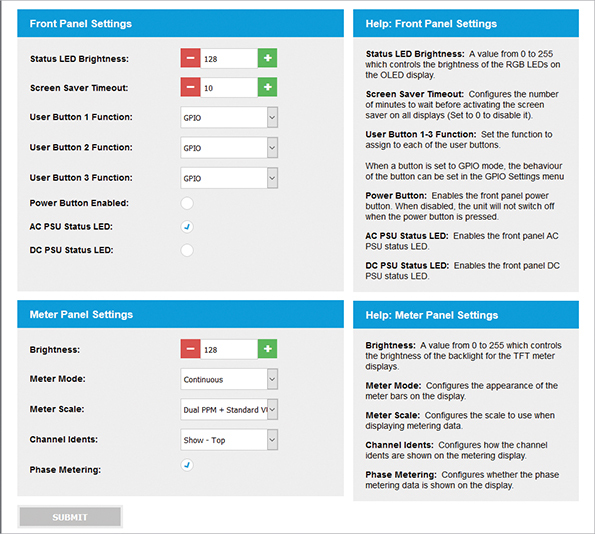 The display and navigation controls allow editing of certain functions, limited to networking (IP addresses, friendly name, etc) and display (brightness and contrast). The front panel controls also include user configurable buttons which can be set-up to perform actions such as activating a GPIO or as a shortcut button to jump to a specified menu on the OLED display. Front panel LEDs show the AoIP network status, synchronisation status and the status of the AC and DC power supply inputs. The brightness of the OLED display and LED indicators can be continuously adjusted for low or high lighting conditions. A front panel power button is available to turn the unit on and off. The power button is disabled by default but can be enabled through the ‘Display Settings’ web page. The ‘D’ version of the portal (e.g. AVN-PA8D) has two bright TFT meter displays which provide a live display of the levels of the physical inputs and outputs respectively. A rotary navigation control can be used to select a single input or output and view its metering data in a more detailed horizontal view. The metering scale used is user configurable to one of 9 different metering scales, with relevant ballistics. The metering scales available are: Dual PPM + Standard VU, EBU PPM, BBC PPM, Nordic PPM, AES Digital PPM, DIN PPM, German PPM, SMPTE RP.0155, Standard VU & Extended VU. Phase metering can be displayed per stereo channel and channel idents can be shown either above or below the metering to identify each input/output. On devices without a meter display, a smaller set of monochrome meters are shown on the main OLED display. For the analogue audio, the AVN-PA8 uses D-type sockets with AES59 analogue pinout, paralleled with 8 x RJ45 connectors using StudioHub® pinout. The ‘T’ version (e.g. AVN-PA8T) uses rear panel terminal block connectors for all physical inputs and outputs. The rear panel contains IEC mains and secondary DC power inputs which provide power redundancy to the product. 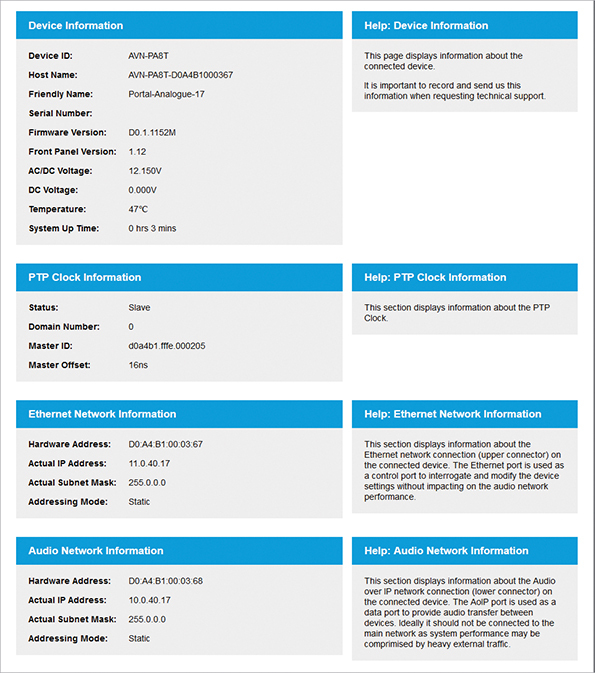 There are two Ethernet RJ45 connections (control and AoIP) and there is an Ethernet SFP module that, when used, replaces the AoIP RJ45 connection, e.g. for a 1Gbit/s copper or optical SFP transceiver. When an SFP is used, this replaces the AoIP RJ45 connection. A rear panel GPIO connector provides 10 local ports which can be user configured as inputs or outputs and provide software-controlled functionality. A voltage free relay contact can be used to operate external equipment. There are virtual GPIO ports which can be used to trigger events over the network between devices. 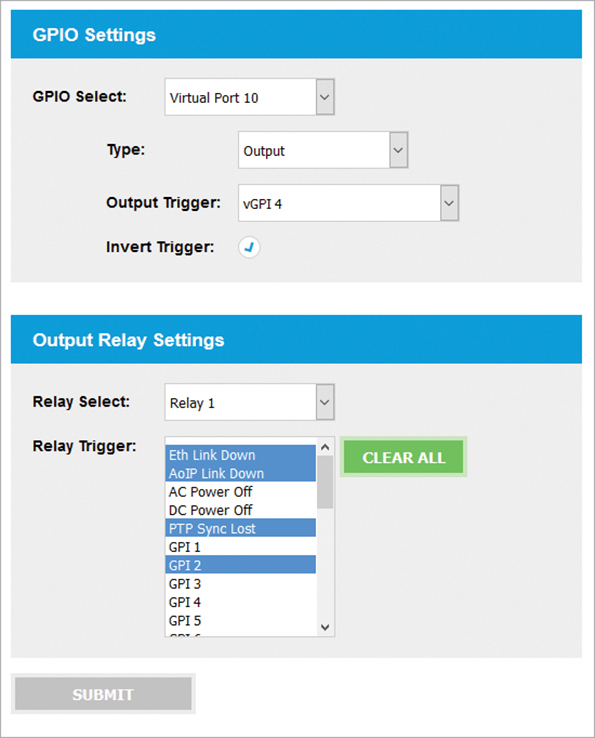 For remote operation and monitoring, SNMP V2 is supported and the units can be controlled using Ember+ commands. The AVN-PA8 can be combined with multiple AVN-HA1 headphone amplifiers to provide a headphone distribution system – the portal output connections can supply analogue power to satellite headphone amplifiers. The AVN-PA8 can be combined with multiple Sonifex AVN-HA1 headphone amplifiers to provide 8 separate headphone signals where each headphone amplifier can be sent a separate feed, mixed from any physical or stream inputs. On portal units with RJ45 outputs, an AVN-HA1 headphone amplifier can be used to listen to the outputs, with the portals providing power and audio signals. The switches on the front panel of the AVN-HA1 can be used as another GPI for muting the output. Product Function: Mix and route analogue & AES67 stream inputs to analogue & AES67 stream outputs. Typical Applications: A powerful analogue & AES67 mix engine which allows for multiple applications: 8 output analogue zone mixer, 8 channel clean-feed generator, 64 channel AES67 stream distribution amplifier, IFB distribution to analogue belt-packs & AES67 streams, 8 channel headphone distribution system (with AVN-HA1 units). 8 x stereo line inputs and 8 x stereo line outputs on D-type sockets with AES59 analogue pinout, paralleled with 8 x RJ45 connectors using StudioHub® pinout. ‘T’ version has audio I/O on terminal blocks. ‘D’ version has input & output metering. Up to 8 AoIP input streams with a maximum of 16 channels to be routed. Up to 8 AoIP output streams with a maximum of 8 channels each (i.e. 64 channels). Dual 1Gb Ethernet & 1Gb SFP port. Dual AC & DC power supply inputs. 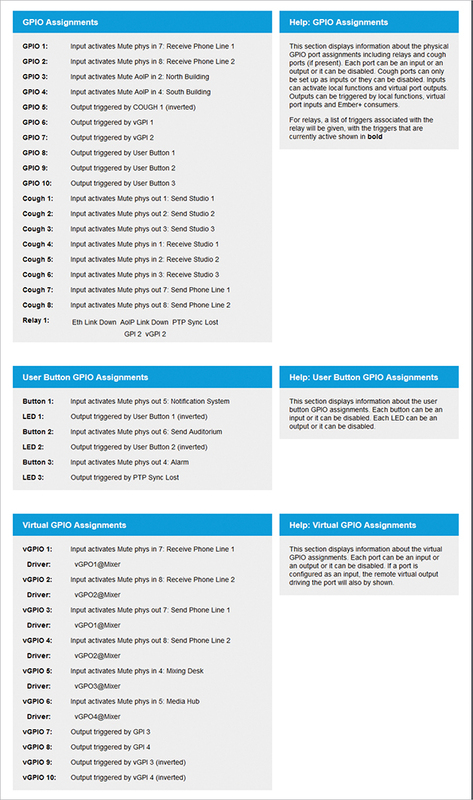 10 user assignable GPIO ports. Inputs: 2 x D-Sub (DB-25) connections (TASCAM AES-59 analogue pinout) paralleled with 8 RJ45 connections (StudioHub+ pinout). Outputs:	 2 x D-Sub (DB-25) connections (TASCAM AES-59 analogue pinout) paralleled with 8 RJ45 connections (StudioHub+ pinout). GPIO: 1 x D-Sub (DA-15) connections. Network: 2 x Gigabit Ethernet, RJ45’s. Power: Mains AC Input: Universal filtered IEC, continuously rated 85-264VAC, 47-63Hz, 20W. DC Input: 4-pin 7.5A power jack socket, 10 14VDC. Fuse Rating: Anti-surge fuse 2A 20mm x 5mm. Inputs: 2 x 24-Pin Phoenix style terminal blocks (Analogue pinout). Outputs: 2 x 24-Pin Phoenix style terminal blocks. (Analogue pinout). GPIO: 1 x 24-Pin Phoenix style terminal blocks. DC Input: 4-pin 7.5A power jack socket, 10-14VDC.